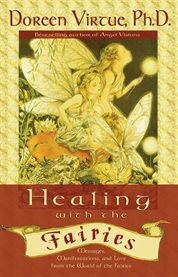 The item Healing with the fairies : messages, manifestations, and love from the world of the fairies, Doreen Virtue, (electronic resource) represents a specific, individual, material embodiment of a distinct intellectual or artistic creation found in Austin Public Library. When a group of powerful fairies contacted Doreen Virtue, her life became an enchanting story of healings, manifestation, and true love. Healing with the Fairies is Doreen's very personal story of how the fairies helped her deal with a divorce and prepare herself for a spiritually based relationship. In this truly inspired book, You'll read how the fairies introduced Doreen to her lifelong soul mate, a man who she later discovered was the boy-next-door shed had a childhood crush on. You'll also learn, along with Doreen, about the fairies incredible powers of manifestation. Doreen shares what the dolphins, mermaids, dragonflies, and other members of the elemental kingdom taught her. You'll see that the fairies have the ability to help you create and attract miracles, and this book can teach you how to work with them to empower and heal your entire life!